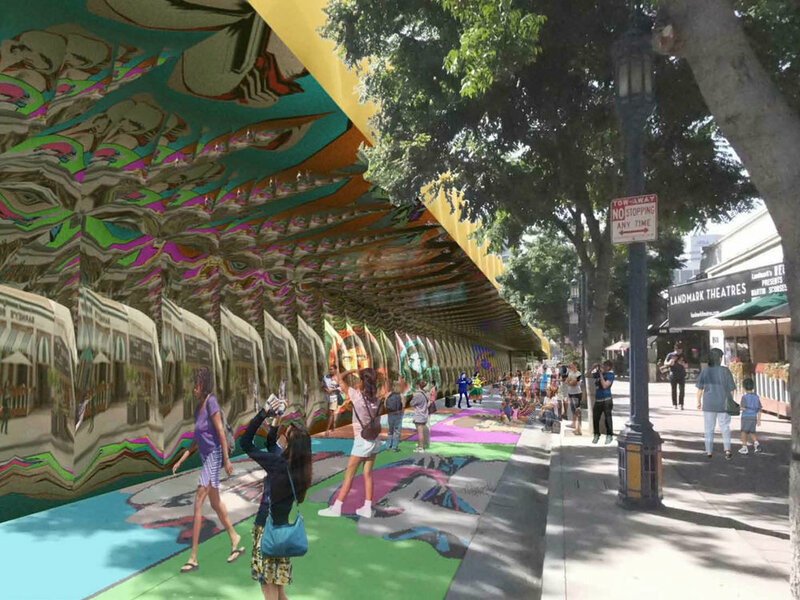 cityLAB's research looked behind the myths about Westwood’s problems to formulate two visionary scenarios: an L.A. neighborhood that could lead the way to a car-less, or at least "car-lite" future; or an arts and culture district that reactivates a dynamic, sustainable place. Westwood Village was once the central hub of the Westwood Community. Opened in 1929, it was developed by the Janss Investment Company as a vibrant shopping district with planned mix of retail use, distinct architectural character, and a strong identity. The model of Westwood village is considered to be one of "smart" urbanism, however, over the years the Village has experienced continual decline with rising vacancy rates and a loss of identity. With the imminent arrival of the subway, the new mayor of Los Angeles in 2013, and current economic slow-down, this is an important time to examine the historical accounts of the village and determine current solutions for the revitalization of this area. Westwood Village vision is a cityLAB research initiative that investigates the highly complex urban and political forces contributing to the current state of Westwood Village culminating with specific recommendations to revitalize Westwood Village as an attractive, economically vibrant, and sustainable area. This study takes place during an important time for three key reasons: first, the arrival of the subway with the decade; second, a new mayor for Los Angeles takes office in early 2013; and third, the opportunity to plan thoughtfully given the economic slow down, particularly in the real estate market. this yearlong project will be concluded in time for Westwood to benefit from these long-term changes, leveraging them in ways that will enhance Westwood Village's revitalization. cityLAB is investigating these forces, their interaction, and their varying degrees of influence in order to make specific recommendations about ways to revitalize Westwood village so that it becomes more attractive, economically vibrant, and sustainable. The recommendations will involve a multifaceted analysis that is urban, economic, environmental, historical, design-oriented, and policy-oriented. With a growing Metro system’s light rail and subway lines extending deep into the Westside, Los Angeles is in the process of reversing its identity as a place of staggering commute times and an unsustainably expanding footprint. 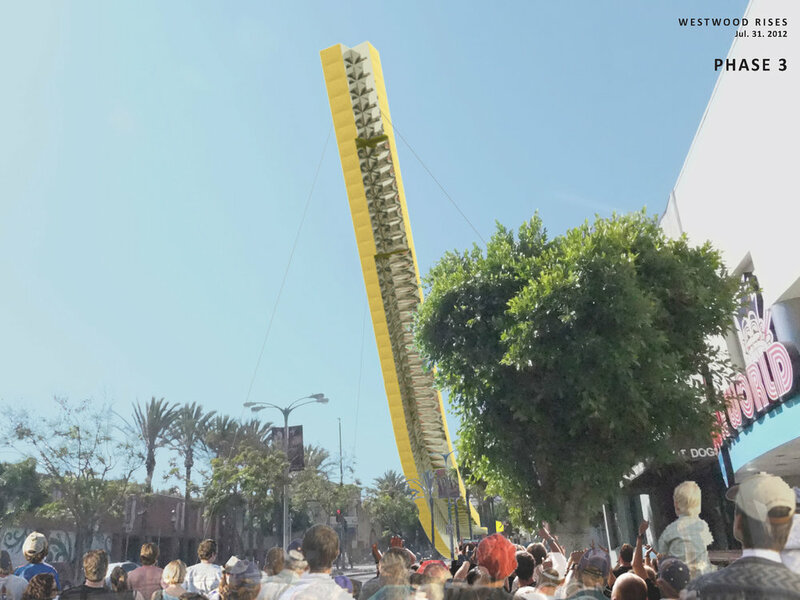 As a way to explore this future, the proposal by Neil M. Denari Architects relies on the dramatic effect that the extension of the Purple Line to Westwood Village combined with the recent Expo Line extension will have on the entire city. With a proposed dedicated express bus lane connecting these two lines along Westwood Boulevard, Westwood Village promises to become a significant node for not only development along the Wilshire corridor but also for the reestablishment of a pedestrian-oriented nexus of activities. By moving cars below ground at Wilshire and Westwood, bikes and pedestrians move freely across one of the most traffic-heavy intersections in the L.A. basin. Perimeter parking garages keep cars at the edges, maintaining the cherished low-rise, historic center of Westwood Village. The central theme of Westwood Blows Up! will revolve around the complex relationships among entertainment, performance, consumption, and technology as well as among spectacles, places, and communities. Through a diverse program of installation, theater, sound, video, games and the Internet, the festival will focus on the affects of entertainment and technology on arts and performance practices and how innovations in the arts and performance contribute to the rethinking of place. In fulfilling that mission, Westwood Blows Up! also seeks to give audience members, community groups, and students of all ages the chance to go beyond the traditional experience of observing an arts event and become active participants in the creative process.